Rob Wells, the former surfer turned music exec, was among the first in the industry to cheer Spotify. In an interview with CNET, Wells says that embracing new business models has paid off. Who are the people making decisions at the big labels? Do they bear any resemblance, in appearance or attitude, to the people listening to the songs they sell? 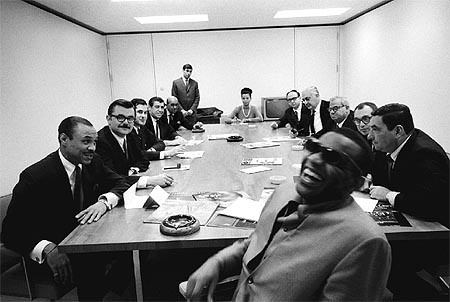 Or do they look like those men in the photograph of Ray Charles, the one taken in 1965 when he was negotiating a new contract with ABC Records? There's Ray, laughing and laid back, the image of cool. But down the long conference-room table is a group that is almost comically uncool: graying, balding, sober men all wearing dark suits. But that was a long time ago, and that's not Rob Wells. Wells oversees digital for Universal Music Group, the largest record company that is home to Lady Gaga and U2. He's the big, formerly rugby-playing Englishman who is wild about video games and Spotify. He's worth knowing because he's leading what he says is the music industry's more progressive approach to digital music. Wells, who just completed his first year as president of Universal's Global Digital business, spoke recently with CNET. Q: So is the music industry coming out of the sector's dark ages? Rob Wells: I have a very macro view of the industry. I look on the industry from a global perspective. I'm fresh off a two-week trip to Asia where I was in Japan, Singapore, and Australia. Consumers are invigorated again about music, they're invigorated about new services, they're invigorated about new devices, which are driving adoption of new services. In five to 10 years when we compare back a bit and look at this massive transition and upheaval of the business, I'm hoping 2012 will be an important year. I hope that it's not just from a digital perspective but a repertoire perspective. I'm very excited about a lot of new stuff we got coming down the pipe from our artists. Who is in the lead? Which service seems to have the momentum, and are there any real iTunes killers out there? Wells: This isn't about knocking existing services and building up others. The phenomenal thing we're seeing is that all of these services are happily coexisting. We haven't seen a decline in any existing service's revenue alongside the launch of a new service or new model in any existing markets. So these new platforms and services are all complementary. This stuff about digital revenues and how freemium will have fun at the expense of other services is kind of irrelevant because it's all incremental money. What we try to ensure is that there is plenty of clear air for every service to exist. And especially since piracy continues to be a challenge, we work to ensure that all of these services can happily coexist because ultimately this is about consumer choice. And the consumers are kind of favoring some services above others and of course you're getting some churn but what we're not seeing is consumers churning away from richer revenue streams onto lesser or cheaper revenue streams. At the moment, none of these new services are cannibalizing. They're all complementary. You look like an athlete. What's your background? How did you get into music, and how did you get into digital? Wells: So, I was driving 'round France with my girlfriend, who is now my wife, and I got home following a year-long tour surfing down the West Coast of France, and I rang a friend of mine who said, would you fancy coming in to an interview with BMG Records in London. They're looking for someone to help out. I fell in to it really. It was one of three industries I wanted to get into. I wanted to be either a professional surfer/snowboarder/skateboarder which was never going to happen 'cause I wasn't good enough. Or I was going to work in the music business or with cars. Fortunately I lucked into a job with a major label back in early 1994. But I kind of worked my way up. The job at the time was dealing with the consumer postal database. BMG was the first major label in the U.K. to have an in-house customer-relationship management platform. It was my job to manage the mail-outs and make sure the data was clean and to control the data entry. I [eventually] moved the postal database onto an e-mail database. In 2000, I was bought out of BMG and put into Universal U.K. and from U.K. I went to international and from there I got the global gig last year. So I'm a sprightly 40-year-old. I still surf. I still kite-surf. I'm not the kind of suit-wearing, cigar-smoking record company executive that people think of. I also think that the team I surround myself with also are quite dynamic, forward-thinking, and in-tune executives. One of the first questions I ask in an interview, after asking what kind of music they listen to, is how do you listen to your music. I can't abide trying to have a conversation with record-company people who don't know how to consume music the way the majority of consumers now listen to music. If you're out of touch with your consumers how can you expect to communicate with them? It's not just music. I'm a voracious gamer. I am into all of the entertainment and home entertainment stuff. I have an Apple TV and Google TV. I am where the consumers are. I think most music execs have to be consuming their entertainment product, including their music, in the same way that consumers are. What about free? We've seen a lot of services that have advertised free music for years now. SpiralFrog, Imeem, and now Spotify. Can you explain how free is evolving? Wells: The consumer-facing side of these services is, yes, free but you have to bear in mind that despite the service being free we still get paid and our artists still get paid. It may be advertising-funded or brand-sponsored or search-funded or a variety of different means and mechanical-cross subsidy deals. There was a deal we cut with Nokia for this Comes With Music service three or four years back where the price of the music was bundled into the price of the device. So again, it felt like it was free. 'Cause the consumer was buying a mobile phone but the price of the mobile phone was increased to cover the cost of the music. We're now doing something similar and quite successfully with Cricket and their Muve Music. What we ensure is that the metrics around a free-to-consumer service is that the pricing is enough that everyone gets a fair slice of the pie, including artists.